Collins Booksellers - A Court of Frost and Starlight: by Sarah J. Maas | Conversation Starters by Daily Books, 9788828339755. Buy this book online. This 2018, Sarah J. Maas releases A Court of Frost and Starlight, a companion tale to the New York Times bestselling series A Court of Thorns and Roses. Set several months after the conclusion of A Court of Wings and Ruin, Feyre, Rhys and their companions are rebuilding Velaris and the Night Court. Winter Solstice is coming. It is Feyre’s first as High Lady. In spite of the festive atmosphere, Feyre, Rhys and their friends couldn’t escape the shadows of the past. Feyre finds out that the ones dearest to her are nursing wounds in their souls. Their struggles will have a lasting impact on the future of their court and the land of Prythian. 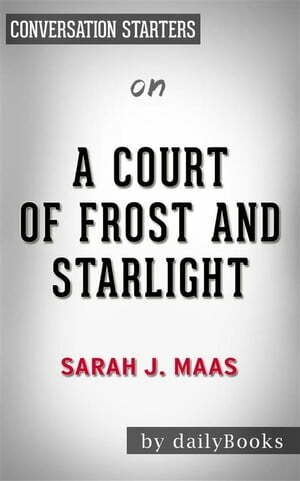 Told through the eyes of Feyre, Rhys and other characters, A Court of Frost and Starlight is a novella that preludes to Sarah Maas’s upcoming novels in the series.